This June, dig into Dunwoody Restaurant Week, an annual celebration of all things delicious! Dunwoody Restaurant Week is the perfect opportunity to savor something new or revisit an oldie, but goodie. Participating restaurants will showcase their best dishes and desserts at set prices, allowing you to sample food and drink from some of the best restaurants in Atlanta. (Winning!) So from June 8-15, we invite you to bring a buddy (and your appetite), eat & repeat... all week long during Dunwoody Restaurant Week. Check back soon for a list of this year&apos;s participants! We&apos;d like to say a huge thank you to all of the amazing restaurants who participated last year. 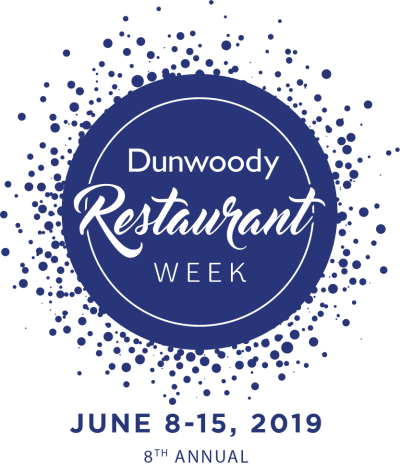 We look forward to another great year of wining and dining for Dunwoody Restaurant Week 2019! Decisions are hard, suggestions are helpful! Check out our FOODIE&apos;S GUIDE TO DRW18 as you plan your weeklong culinary tour through Dunwoody. The Dunwoody Nature Center, Spruill Gallery and Stage Door Players partnered with Dunwoody Restaurant Week in 2018 to sweeten the deal! See below for the great opportunities visitors had to explore Dunwoody&apos;s arts and culture scene while dining around town! - The Dunwoody Nature Center is offering complimentary entry to their summer concert series show featuring the Heather Gillis Band occurring on Saturday, June 23, 2018 with proof of receipts from participating restaurants. - Spruill Gallery is offering 10% off items in the gallery gift shop with proof of receipts from participating restaurants. Offer is valid from Saturday, June 9 to Saturday, June 30, 2018. - Stage Door Players will offer a buy one get one free ticket to Thursday night performances (July 26 and August 2) of Smokey Joes Cafe. To redeem this offer, please call the box office from Tuesday, June 19, to Friday, June 22, 2018 and mention the code DRWSDP. Everyone loves a good food pic! Share yours with us on Facebook and Instagram and don&apos;t forget to use #DunwoodyRestaurantWeek and #DineInDunwoody!